Within the Orientation forums an eaglet can learn the basics of navigating HOL's main site as well as the Roost. A tutorial is also provided for downloading and using mIRC; this is crucial for the recent quiddy recruit! Are class sign ups open yet? Well, you can find out here! 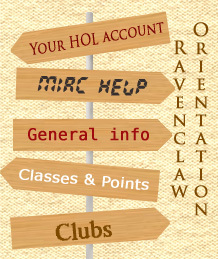 Before using the Ask A Prefect thread, all eagles should double-check the Orientation forum.